Having a payment gateway is indispensable to authorize online payments on an online store. Payment gateways validate your customer’s bank details to complete any online transaction for the product or service purchased through your ecommerce store. WeblinkIndia offers multiple online payment gateways to suit the e-retail store’s needs. Our customizable payment gateway integration can be done with your website or application for smooth transactions. With multicurrency support, secured payment, and simple management, WeblinkIndia ranks among the top payment gateway providers in India. We offer the best payment gateway solutions that can be programmed in any language and are compatible with all major order management and shopping cart softwares. From their personalized checkout page, the users can complete their online purchase with any of the several payment options available. Once the transaction is completed, your client receives a confirmation mail and an on-screen message that assures them that the transaction has been successfully completed. Our payment gateway solutions allow customers to submit payment through all major credit/debit cards and accept over 164 different currencies from 196 countries. 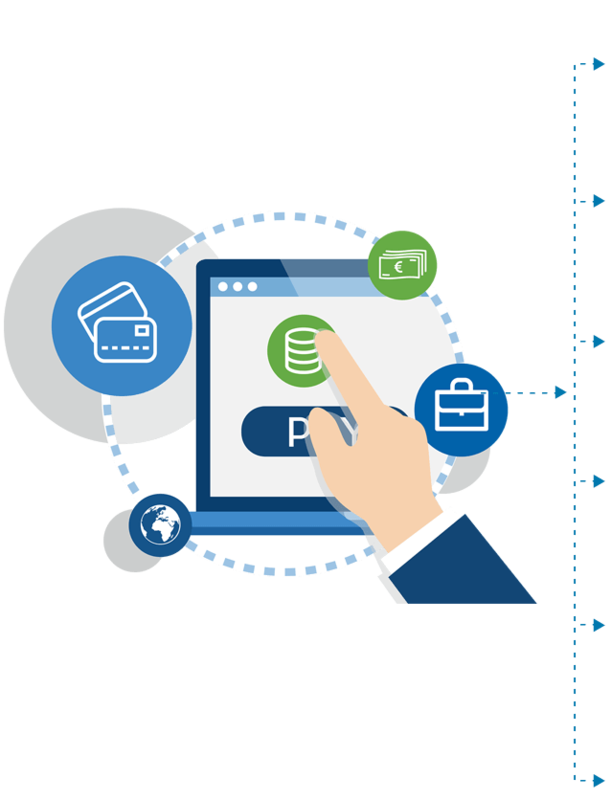 Our payment gateway Integration solutions encompass intuitive interface and streamlined tools to keep a check on cash flow and maintaining buyer database. As your payment service provider, we ensure that all the transactions are protected with PCI-DSS Level 1 compliant technology and fraud scrub. Our security innovations ensure clients stay protected from risks of online fraud. With internet payment gateways, you can collect payment from customers situated around the globe with minimum efforts. The payment gateways act as a point-of-sale terminal for carrying out business transactions online. The online payment process saves the time and effort invested in sharing and receiving Cheque or DDs. All the major payment gateway solutions accept payment from a myriad of countries and support multiple currencies; this reduces the geographical barrier and expands your market. While making a purchase through one of the online payment gateways you receive instant information about cash flow from the account. Acquired by the multinational company eBay in 2002, PayPal started its life as an internet financial services company. PayPal has created a custom X commerce technology platform for all ecommerce products and offers exclusive advantages over other payment gateways; for instance, it is the only gateway that offers on the go billing application for iPhone. Introduced by Google, Google checkout aims at simplifying online payment procedures. Though the gateway doesn’t offer any gift voucher or support through email, phone, yet its lower per transaction charge make it the first choice of many. 2 Checkout is a simplified module of payment gateway specifically made to meet the needs of the small and medium sized businesses. The gateway provides PCI compliance and could be used from many parts of the world as it accepts payment through global credit cards in multiple-currencies. Cyber source offers fast and secure processing in multiple currencies, and services like eCheck, tax calculation, managed billing, and IVR payment. Cyber source is known for its variegated international payment options and is spread through 190 countries in 21 currencies. Linkpoint is a feature packed gateway platform that allows mail/telephonic order and offers a plethora of features like comprehensive reporting, recurring billing, customization, configurable product catalog, and fraud protection.